It's not hard to have accidents with nail polish. You might be painting your nails with polish and your hand slips, getting a bit on your favorite ring. Or the bottle might tip over, splashing some nail polish onto your ring. How you get the nail polish off the ring depends on the material the ring is made from and the type of stone in the ring, if any. Acetone, the active ingredient or solvent in many nail polish removers, might not be safe to use on all types of jewelry. For inexpensive costume jewelry, you might want to try getting the polish off yourself. 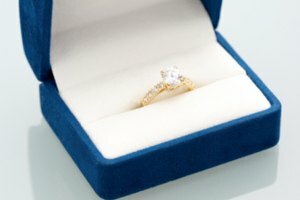 But for an expensive cocktail, engagement or wedding ring, get professional advice from your jeweler first. Wipe the nail polish off the ring immediately with a soft, dry cloth. If you react fast enough, you might be able to remove the nail polish before it hardens. If you are using a quick-drying nail polish, this step might not work. Test a non-conspicuous area of the acrylic ring with non-acetone nail polish remover. Non-acetone nail polish removers are made specifically for use on acrylic nails and contain ethyl acetate or amyl acetate as solvents, which should make them safe for use on acrylic jewelry. Dip a cotton-tipped swab or an orange wood stick wrapped in cotton into non-acetone remover and dab the nail polish stain gently. Repeat until the entire stain is removed. Rinse your ring in warm water to remove all traces of the non-acetone polish remover. Remove the excess nail polish from the ring immediately using a soft, dry cloth. If the nail polish hasn't dried, you might be able to get it off your ring without using any chemicals, solvents or solutions. Make a solution of washing soda with water and a couple of drops of ammonia. Test your ring with the washing soda solution in a spot that is concealed from view before applying it to a prominent nail polish stain. Wipe the stained areas on your gold or silver ring with the cloth dipped in washing soda solution until the nail polish stain is completely gone. Rinse your ring in warm water to remove the washing soda solution. 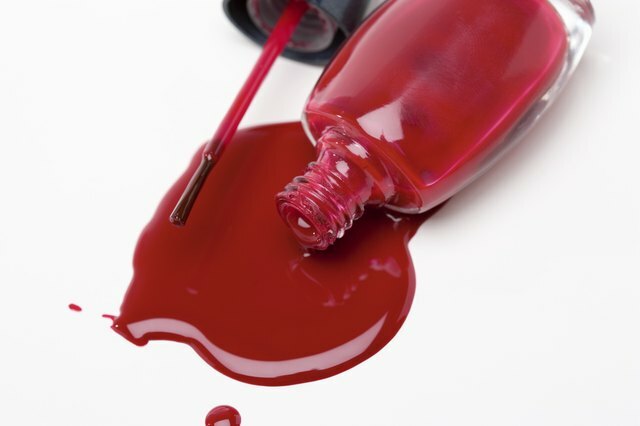 If the nail polish doesn't come off with a removal solution, wait for it to dry completely. You might be able to scrape it off yourself with a fingernail. Don't use any type of implement that can scratch or damage your ring. Nail polish can permanently stain some types of stones, such as pearls or turquoise. 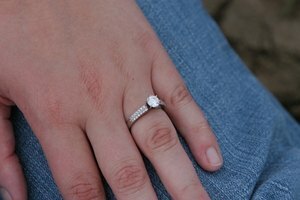 Consult your jeweler for advice if you get nail polish on the stones in your ring. If your acrylic rings are painted, a solvent might dissolve the paint away. Test any type of solvent in an inconspicuous area of the ring before using. 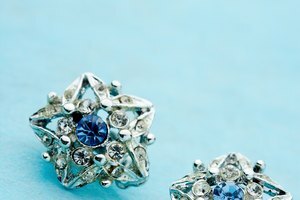 Be careful when using solvents around any fittings or places where embellishments are glued on. A solvent might dissolve the glue holding the stone or embellishment in place.